Animals! #AJChallenge Day 4. One of my favorite subjects, but I find that I don’t do many animal drawings really. Not unless it is part of an assignment or challenge. I am thinking that I will add animals to be subject matter for this year. They aren’t easy, so lots of concentration required. A good thing. Today I got the year right! This cat was hanging out in Castine in front of Markel’s bakery last summer. She had such a personality. You could tell she was really engaged by everyone coming by. I think that she was mostly interested in our dog Big and that is why she looks so intense. I took a bunch of photos of her, I think I will do a few more sketches of her. Good practice. 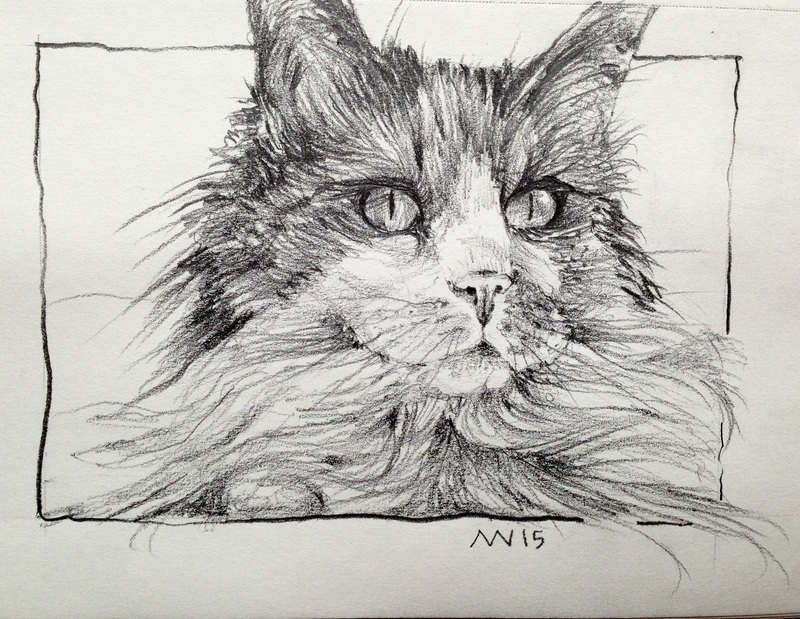 This entry was posted in Uncategorized and tagged #ajchallenge, animal, castine, cat, drawing, graphite, maine. Bookmark the permalink. I love that bakery! You did an amazing job with this cat!! Markels is awesome! We spend way too much time and money there in the summer and fall! Hi, what challenge are you doing, if you don’t mind me asking? This one is lovely! I’m so far behind on commenting and keeping up. Cats are so hard to draw, to get the proportions right, and this has such a freshness.